Llannor Peggy has foaled a very smart black colt, by Croniarth Texas Gold. Nicely marked with four white socks and a blaze. One for the showring! A strong colt with good bone and showing to be a flashy mover already. 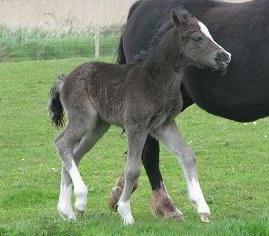 Sold and will be leaving for his fantastic new home at weaning.